18+ All Players | Bingo room will be available only for first 7 days from your registration day | Card validation required | Winnings will be in form of Bingo Bonus only and Wagering (4x on Bingo) apply on winnings | Further T&Cs Apply. Harrys Bingo is not only a great bingo site offering some amazing rewards. 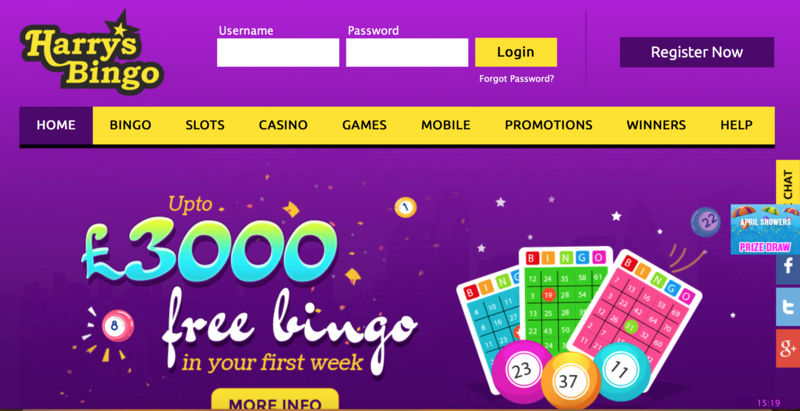 It’s also one f the best sites to offer boku as a way to deposit, offer £3000 in free bingo in your first week of joining, and is a top notch mobile bingo site. Let’s get this straight, Harrys bingo isn’t a huge name, few players will have heard the name but don’t let that put you off. This bingo site is part of the best bingo network and uses cozy games software. What that means for us as players is something a bit different and possibly just what you have been looking for. All new players are made to feel very welcome at Harrys! For 7 days after you register you can play in up to £3000 of bingo games absolutely free. The newbie room is open to new players 24 hours a day. If you’re a new customer all you need to do is register, login and validate your details. this only takes a few mins and you can then enjoy 7 days totally free bingo. Any winnings must be wagered 4x before withdrawal, buy hey can we complain? It’s free bingo and it doesn’t get much better than that. After you haven played you free bingo and are ready to make your first deposit rest assured more bonuses are ready to claim. You’ll be rewarded here for your first 3 deposits with 3 separate bonuses of 300%, 150% and 100% as outlined below. Even if you deposited juts £10 each time you would get £55 in free bingo cash courtesy of Harrys Bingo. This is one hell of a rewarding bingo site to be a member of. You could be surprised to find that there are plenty of games and bingo variations available here as shown in the below list. The various rooms are open 24 hours a day. Ticket rices vary from free (of which there are plenty) up to around 25p for the weekly Jackpot games. There is a lot of value for money bingo over at Harrys Bingo site and it’s well worth trying. If you want a non run of the mill bingo site that isn’t part of the huge networks we ar all getting a little bored of, then Harrys Bingo is a wise choice. With banking options including PayPal, Neteller, Boku pay by mobile, Skrill and PaySafeCard it’s easy to see this site tries to keep players happy. The same goes for the constant rewards and bonuses. Very few of the bigger names even come close to being this rewarding. We loved and still live playing here, the site is fun, the chat lively and the games just keep getting better. A great all round site that’s got players best interests at heart.